Last week marked the end of the second month of LOGITECH G CHALLENGE, our free three-month League of Legends competition. Each week for three weeks, hundreds of players nationwide queued up to earn points for themselves and one of four alliances—Arcade, PROJECT, Pool Party, and Star Guardian. Then, at the end of each week, the top players walked away with prizes including a G502 Hero Gaming Mouse from Logitech G! As we enter the third and final month of gameplay, players will take the competition to a new level as they battle it out to win our grand prize: an Alienware Area-51 Gaming Desktop PC and PRO Gaming Gear Bundle from Logitech G. Read on to hear what went down in March, which alliance came out on top, and which top score holders will be going home with a G502 Hero Gaming Mouse and G513 RGB Mechanical Gaming Keyboard. For a minute there, it looked like Pool Party would be taking home the gold. It would have been a fantastic comeback for the alliance after their last-place finish in February. However, the Arcade alliance clinched it in the third week of gameplay to come out on top—a significant improvement to their third-place finish the month before. 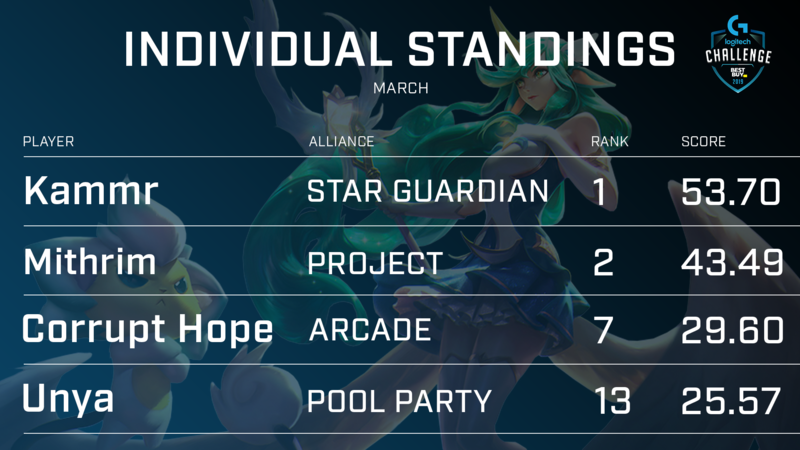 Surprisingly, PROJECT and Star Guardian, who had occupied the top two spots throughout the month of February, fell to the bottom of the leaderboard early on in March, and finished in third and fourth place, respectively—both more than 100 points behind Arcade and Pool Party. See the full Alliance Standings here! 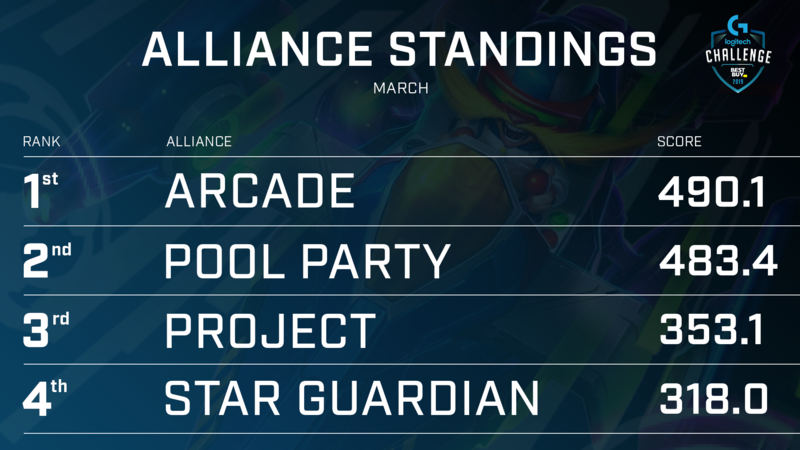 While Arcade and Pool Party topped the alliance leaderboard throughout the month of March, the individual standings tell a very different story. Instead, players from Star Guardian and PROJECT dominate the top of the individual leaderboard—Arcade and Pool Party don’t make an appearance until 7th place. In first place repping the Star Guardian alliance is Kammr, who in February played for PROJECT and finished in 28th place overall. Mithrim from PROJECT, a newcomer who didn’t even play in February’s LOGITECH G CHALLENGE, cinched second place. Corrupt Hope, who like Mithrim also abandoned PROJECT after February, took 7th place for the Arcade alliance. Finally, over in Pool Party, Teał performed highest in the alliance—however, since Teał already won February’s monthly prize, the title of Pool Party MVP will go over to Unya, who finished in 13th place overall. See the full Individual Standings here! 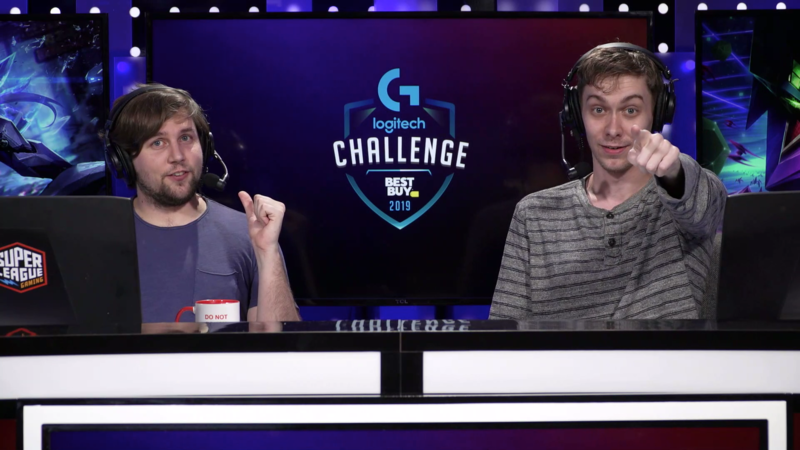 Every week of LOGITECH G CHALLENGE, we’ve covered your gameplay live on Super League TV! Tune in Wednesdays at 9pm Eastern | 6pm Pacific to see all the action shoutcasted on stream. Then, after tournament days, submit your gameplay clips here to be featured on our YouTube highlight reel. Find all our streams here! Two months down, one to go! Recruitment for the third and final month of LOGITECH G CHALLENGE is open now through April 6, and it’s not too late to join the battle. Sign up, choose your alliance, and queue up on Wednesday, Saturday, and Sunday evenings to rack up points for you and your teammates. Participation is free and you’ll have the chance to win prizes including a G502 Hero Gaming Mouse, G513 RGB Mechanical Gaming Keyboard, PRO Gaming Gear Bundle, and an Alienware Area-51 Gaming Desktop PC. 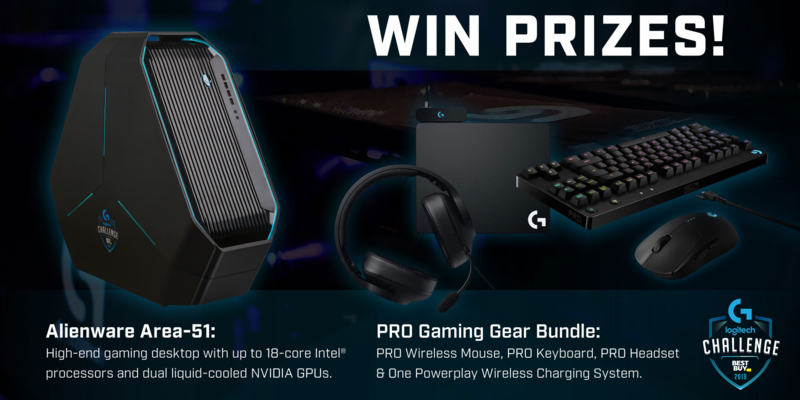 Join the LOGITECH G CHALLENGE here! For all updates related to LOGITECH G CHALLENGE and other League of Legends events and offers, follow us on Facebook, Twitter, and Instagram!